When you add a modern page to a site, you add and customize web parts, which are the building blocks of your page. You can connect some web parts to each other to create an interactive and dynamic experience for your page viewers. For example, you can connect a Document library web part to a File viewer web part. When a user clicks a file name in the Document library list, the File viewer shows the contents of that specific file. 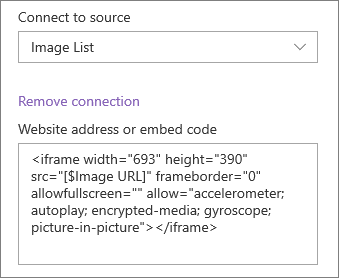 Or, connect a List web part to an Embed web part, and add custom code for a variety of dynamic experiences. The web parts in this article are not available for use on classic pages. Web parts you can connect include: the List properties web part, File viewer web part, and Embed web part. Here are some examples of how you can use these connected web parts. 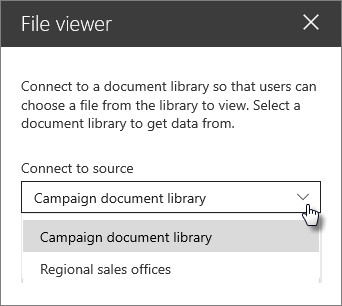 In this example, users can browse through a library of campaign documents and see the content in a selected file without leaving the page, and without having to open each file. On your page, add a Document Library web part with the library you want to use, and add a File viewer web part. If you're adding the File viewer web part for the first time, the Recent documents pane will open. Click Cancel on the bottom right of this pane. Click Edit web part on the left side of the File viewer web part. Click the ellipses (...) at the top right of the property pane, and then click Connect to source. Under Connect to source, select the document library you want to use from the drop down list. Click the X at the top of the pane to close it. Click Save as draft at the top of the page. 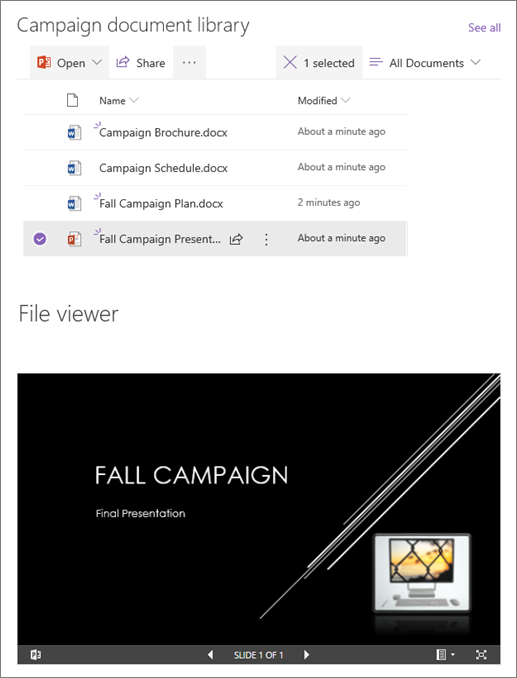 Test your connection by selecting a document from the Document library you chose. You should see the document displayed in the File viewer web part. When you're ready for your audience to see the page, click Publish at the top right of the page. When you have a large list with many columns, it can be hard for users to find the specific information they are looking for. With the List properties web part, a user can select an item from a List web part, and see only the value(s) you specify. In the following example, a List web part contains a list of Regional offices. 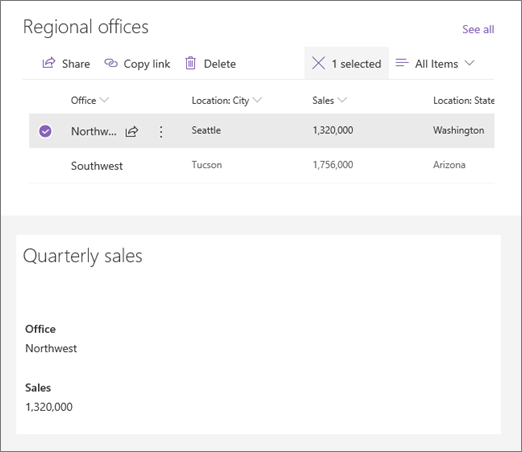 When the user selects an item from the list, the List properties web part displays only the Office name and Sales data. On your page, add a List web part with the list you want to use, and then add a List properties web part. Click Edit web part on the left side of the List properties web part. Under Connect to source, select the list you want to use from the drop down list. 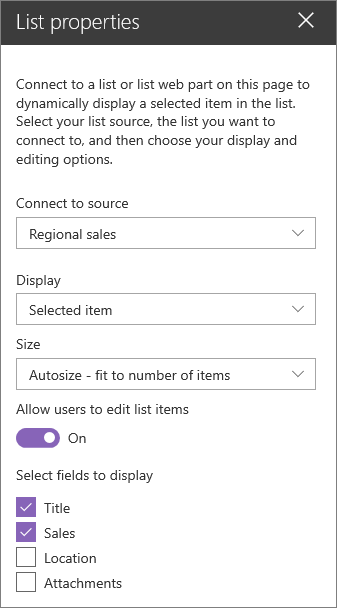 Under Display, select what you want the user to see on your page. Under Fields to display, select the check boxes next to the columns that you want to show values from. Test your connection by selecting an item from the list you chose. You should see the value you specified in the List properties web part. With the Embed web part, you can enter links or embed code that use variables, allowing you to show a wide variety of items depending on what your page viewer selects. 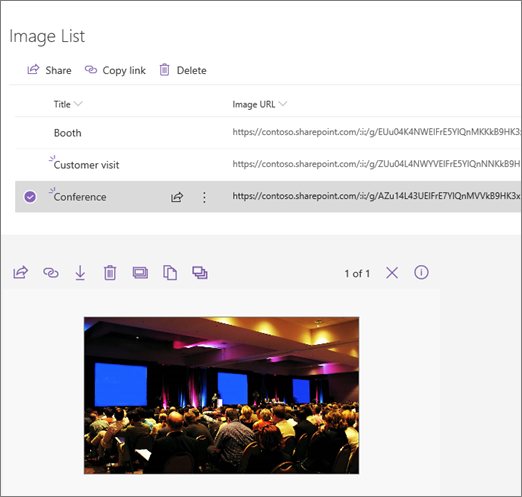 Here are three examples of how you could show selected images, videos, and locations. In this example, the List web part contains a list with video titles and IDs for several YouTube videos. When a user chooses a video from the list, the Embed web part shows that video. 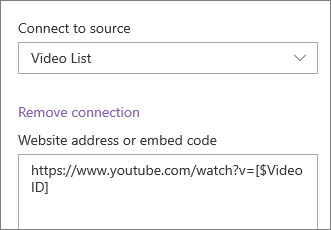 The link in the Embed web part uses a variable to represent the video ID of the video chosen by a user from the list. On your page, add a List web part and choose the list with the video IDs. Add an Embed web part. Click Edit web part on the left side of the Embed web part. Under Connect to source, select the list from the drop down. Test your connection by selecting an item from the list you chose. You should see the video displayed in the Embed web part. 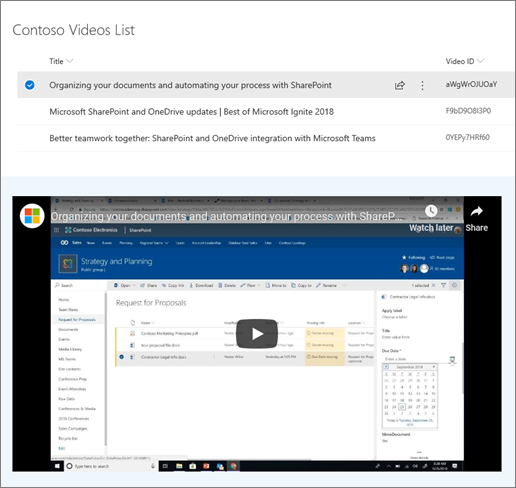 In this example, the List web part contains image titles and URLs for images stored on a SharePoint site. When a user chooses an image from the list, the Embed web part shows that image. In this example, IFrame code is used in the Embed web part, and the variable represents the image link. Create a list that has a Title column and a column for your Image URLs. Tip: To get an URL for your image, go to the library where the image is stored, right click on the image, and click Copy link. Then click Copy. Now you can paste the link into your list. On your page, add a List web part and choose the list with your Image URLs. where [$Image URL] is the variable that represents the column name for the Image URLs. Test your connection by selecting an item from the list you chose. You should see theimage displayed in the Embed web part. In this example, the List web part contains locations and their coordinates. 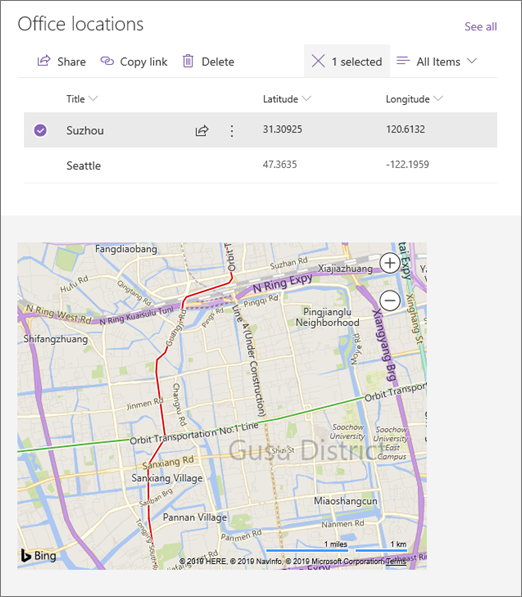 When a user chooses a location from the list, the Embed web part shows that location on a Bing map. In this example, IFrame code is used in the Embed web part, and the variables represent the coordinates. Create a list that has a Title column and columns for longitude and latitude. On your page, add a List web part and choose the list with the location information. where [$Latitude] and [$Longitude] are the variables that represents the column names for each of those points. Test your connection by selecting an item from the list you chose. 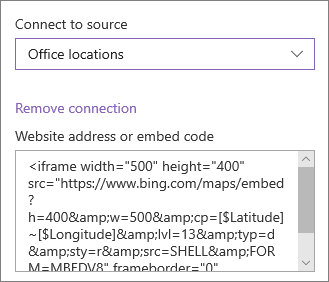 You should see a Bing map that shows the location displayed in the Embed web part. Embed code must be iframe-based (that is, start and end with <iframe> tags). Embed code that uses <script> tags is not supported. Only secure web sites can be embedded. Make sure the URL of the web site begins with HTTPS.